Is stuffing the best Thanksgiving side dish? I would say yes, although mashed potatoes and gravy has to be a close second. A good stuffing recipe delivers a balanced combination of flavors and textures, without being bland or mushy. 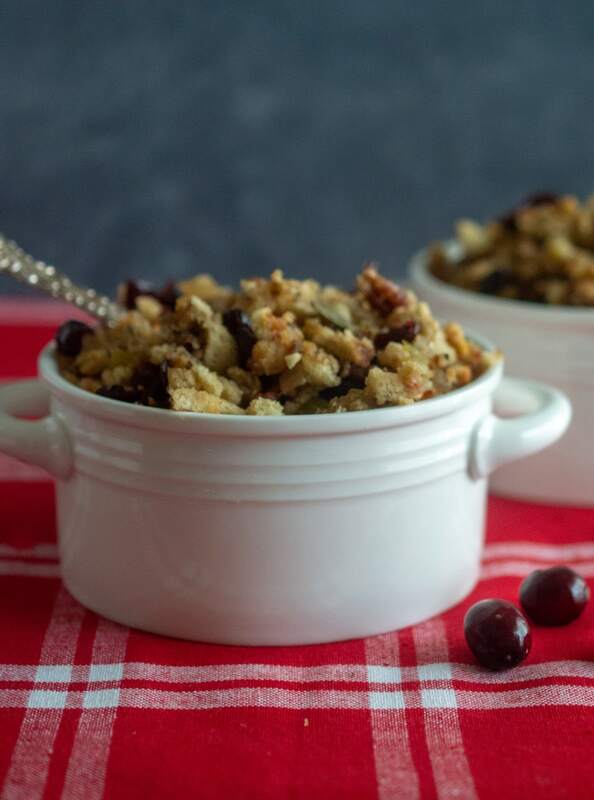 Last Thanksgiving, I made this cranberry sausage stuffing for the first time, and it got rave reviews! Savory sausage, sweet dried cranberries, garlic, herbs, and black pepper create a perfect balance of flavors. Toasted pecans add a bit of crunch. 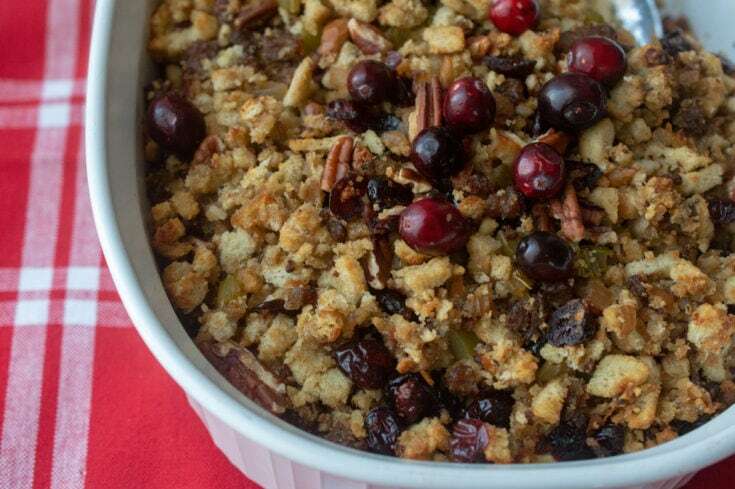 I have a feeling cranberry sausage stuffing will be on our Thanksgiving table for years to come. It’s also a great side dish you can make any time to go with roast chicken, or even a store-bought rotisserie chicken. 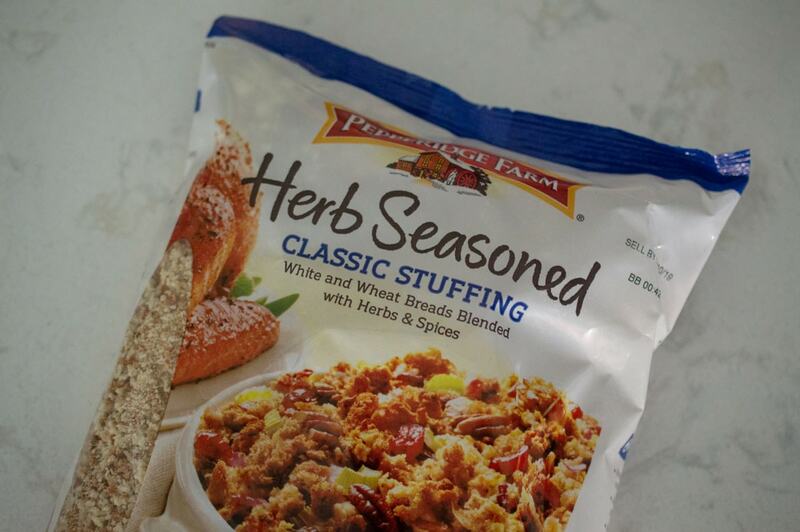 Your stuffing making process will be easier if you prep all the ingredients ahead of time. Professional chefs call this mise en place, or putting everything in place. If you have all the ingredients and tools assembled before you start, the recipe comes together quickly. Dice one medium yellow onion and four medium stalks celery. You want a small dice, about 1/4 inch. You will have about one cup of diced onion and one cup of diced celery. Toast one cup of pecan pieces in a dry skillet over medium heat. Toasting the pecans helps them keep their flavor and crunch. Keep stirring them, because they burn easily. When they start to brown a little and smell toasty, remove them from the heat. Set these aside with the rest of the ingredients. 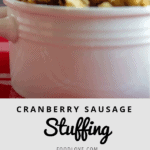 A key ingredient for this cranberry sausage stuffing is a good quality, well seasoned sausage. Jimmy Dean regular or sage style sausage would be a good choice for this recipe. 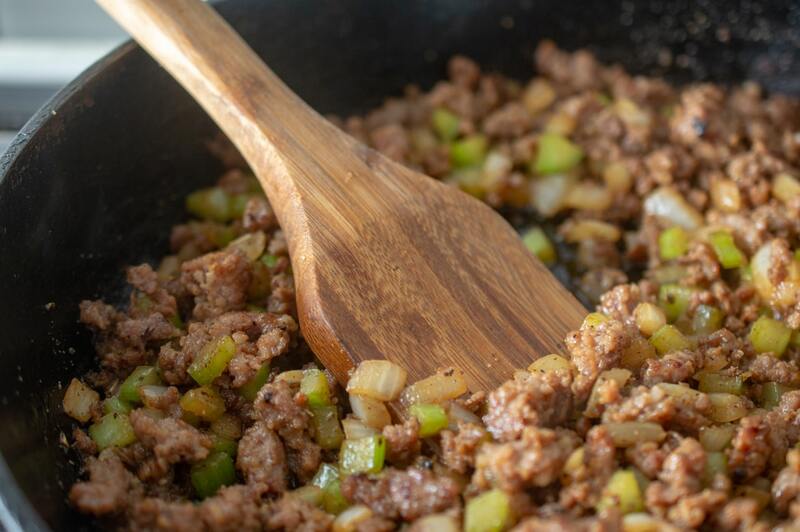 Use bulk ground sausage, not link sausage. Sauté the sausage over medium high heat until it is cooked through. Chop the sausage into small pieces as it cooks (I use a wooden spatula for this). Add the celery, onion, garlic and butter, and cook until the celery and onion are translucent and starting to soften. Remove from heat. This stuffing is moist but not wet, which is what I like. If you like a wetter stuffing, add 1/2 cup to 1 cup more liquid (a mix of apple juice and broth). If you have homemade chicken or turkey broth, that is absolutely the best, but canned or reconstituted broth is also good. Put the stuffing in a medium casserole dish, preferably one that has a lid. Bake your cranberry sausage stuffing, covered, at 350 degrees for 30 minutes. Uncover and bake another 10 minutes. By this time your stuffing will be cooked through and toasty on top. Isn’t it gorgeous? 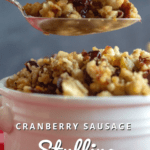 This cranberry sausage stuffing is a perfect balance of savory and sweet, and the sausage flavor comes through in every bite. 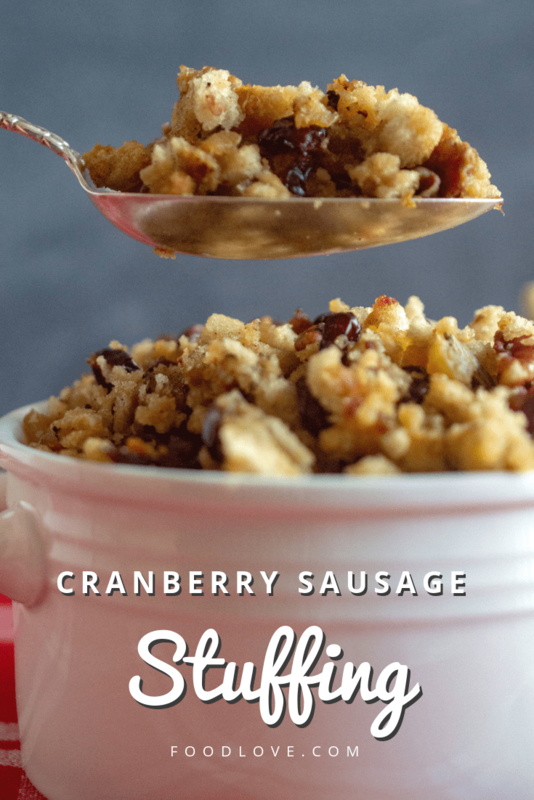 Cranberry sausage stuffing is a perfect balance of savory and sweet, and the sausage flavor comes through in every bite. It's a family favorite for Thanksgiving, or a memorable side dish you can make any time. Preheat oven to 350 degrees. Grease a medium baking dish with butter, or spray with cooking spray. Dice the celery and onion; set aside with rest of ingredients. Toast the pecan pieces in a dry skillet over medium heat for 3-5 minutes, stirring constantly. Remove from heat and set aside. Sauté the sausage in a skillet over medium high heat until cooked through. Add the celery, onion, butter, and garlic, and cook about 5 more minutes until the vegetables are translucent and beginning to soften. Remove sausage/vegetable mixture from heat. 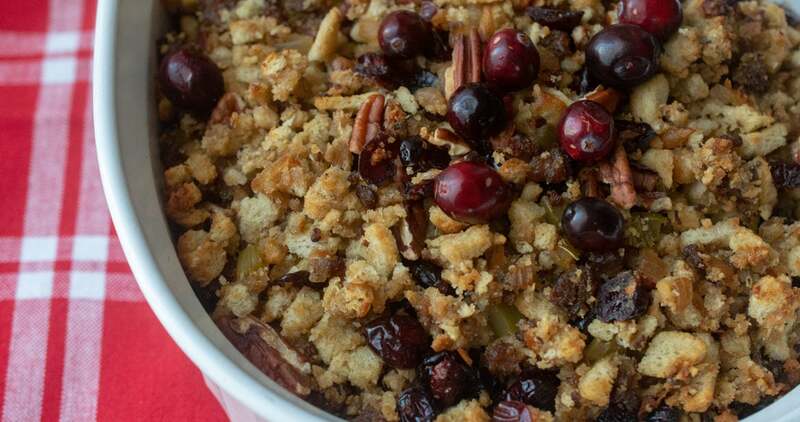 Combine stuffing mix, sage, dried cranberries, chicken broth, apple juice and black pepper with the sausage/vegetable mixture in a large mixing bowl. Stir until well combined. Taste and adjust seasonings. Put the stuffing mixture in the greased baking dish and bake, covered, for 30 minutes. Uncover and bake another 10 minutes until the top is lightly browned. This is a moist but not wet stuffing. If you like a wetter stuffing, add 1/2 cup to 1 cup more liquid (a mix of apple juice and broth).